Harbor Lakes at Bonita Bay in Bonita Springs, Florida. Located just off of Bonita Bay Boulevard, in the Heart of Bonita Bay is the coach home enclave of Harbor Lakes at Bonita Bay. 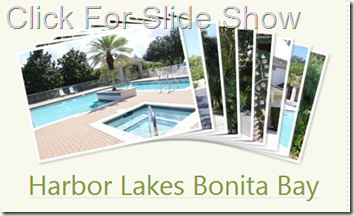 Harbor Lakes is a secluded complex of eighty condominium homes. There are sixteen two story buildings offering a home owner the choice of first floor or second floor living. Homes sizes in Harbor Lakes range from 1,370 – 1,924 square feet of living area with a minimum of two bedrooms and up to three bedrooms, depending upon the floor plan. Each condo home in Harbor Lakes has a private one-car garage and screened lanai. The views from the lanais of Harbor Lakes condominiums range from lake views to preserve views or a combination of both. There are no golf course view units at Harbor Lakes. The buildings at Harbor Lakes were constructed 1993-1994. The community is now built out. There are only resale condominiums available. Communities in Bonita Bay that are similar to Harbor Lakes include Eagles Nest at Bonita Bay, Hammock Isle at Bonita Bay and Hamptons at Bonita Bay. Condo owners at Harbor Lakes also have access to optional marina membership, golf course membership, fitness center, tennis center and more are available separately. Home owners in Harbor Lakes not only enjoy the resort lifestyle of southwest Florida but also the great amenities of Bonita Bay which include three interior parks, a private beach park, miles of walking paths, tennis courts and a boat ramp at River Park. To learn more about the amenities, read also: Bonita Bay Golf and Country Club.